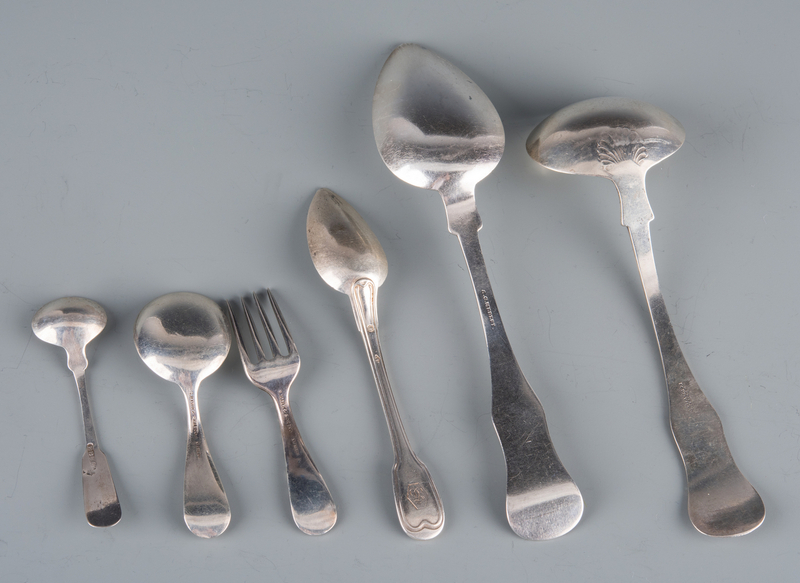 Group of 14 pcs assorted silver flatware, including pieces of Kentucky interest. 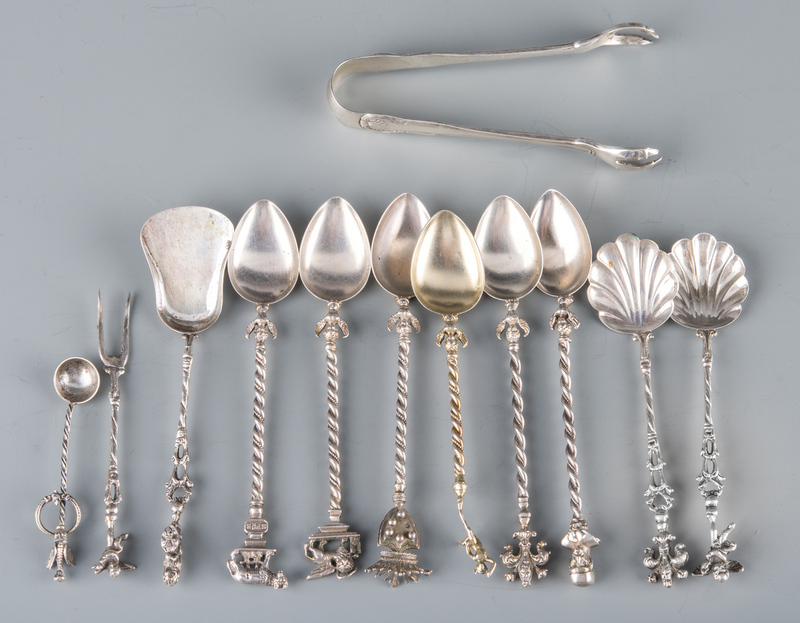 Includes 5 coin silver or early sterling tablespoons or serving spoons in the Queen's pattern with shell, incuse marks on backs of handles of A. G. Medley (active Louisville, KY 1835-1849); 1 coin silver or early sterling gravy ladle in the Queen's pattern with incuse mark of G. Griffin Louisville (active c. 1840-1850+); 2 coin silver Sheaf of Wheat pattern salt ladles, marked E. B. 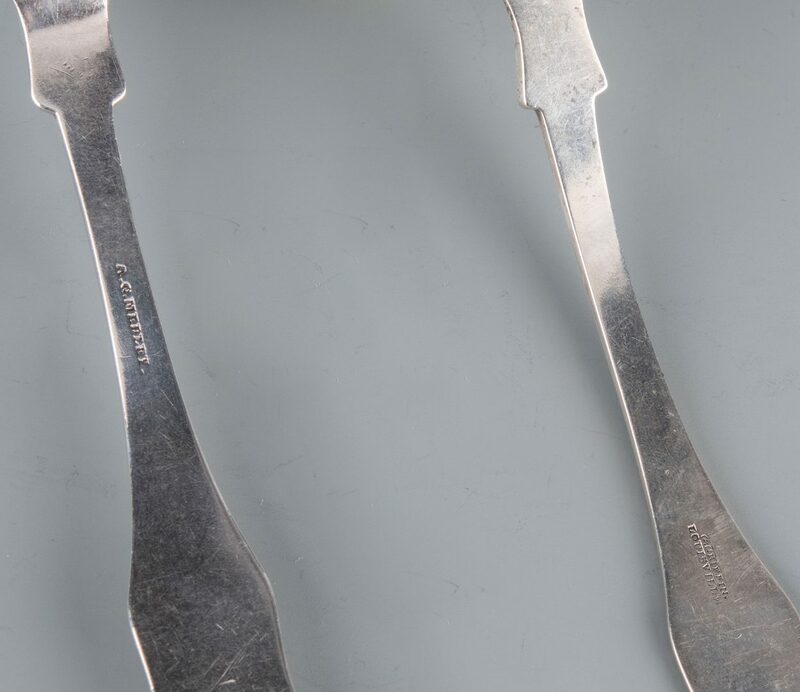 & Co. in rectangle (Erastus Barton & Co., NY or E. Benjamin & Co., CT), monogram ARP; 2 Gorham coin silver ladles in a classical revival pattern (possibly Josephine), monogram HSG; 4 French 1st Standard Paris silver teaspoons in the fiddle thread pattern; 1 pair sterling silver sugar tongs in the King pattern by S. Kirk & Son; 1 sterling Baby fork and 1 baby spoon in the Repousse pattern by S. Kirk & Son Inc; and 1 salt or mustard ladle in the Colonial pattern by Tiffany & Co., monogram G. 13.84 oz troy combined weight coin silver; 2.98 oz sterling, 2.8 oz .950 silver. 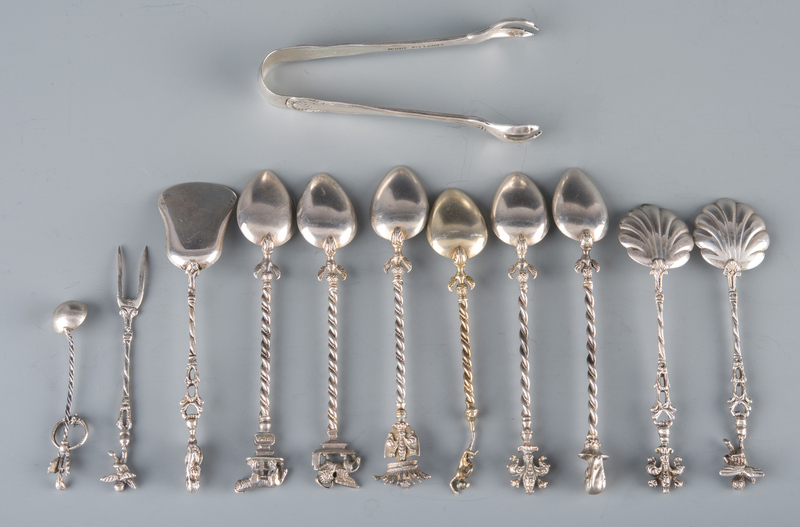 Also included are 11 pieces of Continental silver marked .800 including 9 demitasse spoons with twisted handles and figural motifs at ends, 1 salt spoons, and 1 pick, 4.01 oz troy. 25 items total. CONDITION: All items very good condition.